CORALVILLE — “Shuffle. Play. Listen” is terrific, challenging music-making from two fine music-makers, performing the works of seven composers. Presented by Hancher Auditorium at the Coralville Center for the Performing Arts on Thursday (3/28/13), the evening was devoted primarily to the work of contemporary composers, including Phillip Glass, Sergei Prokofiev and Bohuslav Martinu. Despite a brief nod to the classical past with Johann Sebastian Bach, the concert was about “crossover,” featuring music from the pop-rock and film worlds. The program included the work of celebrated composer Bernard Hermann from the score of Alfred Hitchcock’s film, “Vertigo.” This is haunting, eerie music that speaks effectively of longing, loss and mystery, with visions of Kim Novak and James Stewart floating in my head. Also in the mix was music transcribed for cello and piano from rock bands Tears For Fears, Radiohead and Arcade Fire. The predominant tone of the concert was dark. 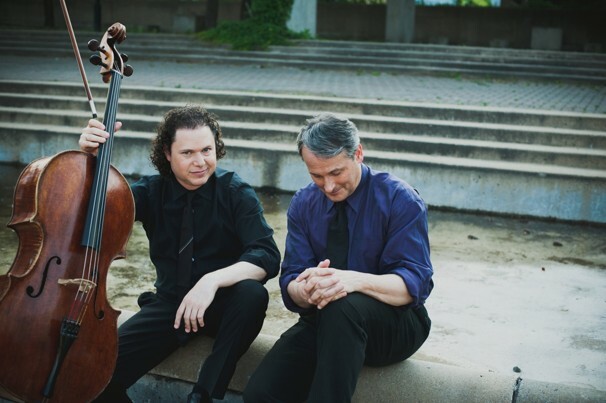 One of the principal pleasures of the evening was Christopher O’Riley playing on a Steinway concert grand piano and Matt Haimovitz playing a 1710 cello from Venice. The cello, in particular, sounded incredibly resonant in this small, sensitive theater. The advanced level of sonic success of both musicians left my ears purring in disbelief, as they rarely get treated this well. I admire the quest of these two superb musicians, who play together impossibly well, for informative juxtapositions of new music. Also new was their use of iPads instead of sheet music. The two men talk easily with the audience, as well as with each other. It creates a relaxed evening, concentrated on intriguing music. The apex for me was the Prokoviev Cello Concerto, written in 1949. All three movements were deeply satisfying, in a grim-grey dimension, as if they were written to accompany the paintings of Anselm Kiefer. The music drives forword agressively, like the creation of volcanic glass, sharp and deadly. The final movement has a “Mozartean effect,” to quote O’Riley, but is without the upbeat joy of Mozart. This is rather a swift dance of concentration camps and of angry mourning. The cello playing was nothing short of incredible. The glorious old cello really had a buzz on. Another successful piece, surprisingly so, was “The Orchard” by Philip Glass. A melodic tone poem, it depicted the orchard as a quiet, lonely place: no leaves falling, no wind, way beyond melancholy. It evoked an image of a couple standing easily in an old olive grove with its faded greys and greens. The work was not particularly minimalistic, without the repetitive runs and rhythmic chording that Glass sometimes drowns in — an enticing piece of music, one that would be perfect for a ballet. Indeed, the music is very fast, almost machine-gun speed, marked by abrupt dynamic shifts. It is frantic, even frenzied, at times. The purposeful noise evolves into recognizable rock and roll chords, and on into a rapid-fire, harsh beauty. To fully apprehend this work, I would need to hear this piece again and again. For now, it remains in my ears as an end of the world madness, in which there is an evolving structure. Is this the goddess Maya, dancing the illusory universe? Finally, I enjoyed Arcade Fire’s “In the Back Seat.” The piece moves from a delicate tenderness to an abrupt muscular drive, and then back to a playful tenderness, softly concluding.